and fun, festive things to do. It is open from 11am to 8pm and is a great day out for the whole family. From Christmas present ideas to delicious street food, there will be something for everyone from our Market traders. There will be indoor stalls in St Wilfrid’s Parish Hall, two rooms in the Methodist Hall and outdoor stalls along Cross Street and on the Methodist Church car park. This year, Market Place will be the foodie area with hot snacks and more. The Entertainment marquee is on the Parish Hall Car Park again this year and there will be acts from noon until 8pm. Choirs from all three Standish primary schools will be performing and Wigan Ukulele Club will also make a welcome return. There will be bands and singers too. The Unity Club, on Cross Street, will open in the afternoon for the first time to host a Festive Karaoke where you can belt out your favourite Christmas hits with money raised for charity. Standish’s Albion Ale House will head up our drinks marquee and there will be a mobile gin bar from OneTen Bar and Standish Voice’s own bar serving mulled wine, Prosecco and soft drinks. We will have a Living Nativity, where children can pet nativity animals in a safe environment. There will be all manner of creatures in a Christmas setting. And there will also be a festive photo booth where people can dress up in seasonal costumes and take photos of themselves with friends and family. Standish Library will be the place for children to enjoy themselves with a Punch and Judy stall, ice cream, a face painter, games on the lawn and, of course, Santa in his grotto (tickets to see Santa have now sold out). It is all coordinated by the wonderful Friends of Standish Library. The Santa Trail returns too, a fun route for families around Standish finding the knitted Santas – with a prize or two at the end as well. At 4pm, there will be a Community Carol Concert in St Wilfrid’s Parish Church to which everyone is invited; Cross Street Arts will have an open day and the Parish Hall and Methodist Hall will also be open for refreshments. The Methodist Church will also be open for activities during the day. 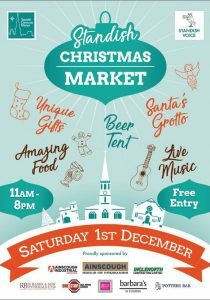 And watch this space, because we will be announcing some great surprises at the Market too! The whole event runs from until 8pm before Standish Live is due to begin with bands in Standish pubs into the night. Many thanks to our company sponsors this year – shown on the flyer – especially to our Gold Sponsor, Ainscough Group. Standish Christmas Market 2017 was hugely popular again and Standish Voice would like to thank the community, our organising committee, our volunteers, the traders and nearby residents. Together they made it a roaring success. The Market was bigger and better than in 2016 with double the amount of stalls, bigger marquees, more venues, more entertainment and attractions and, despite the poor weather, around 5,000 people attended, with thousands of pounds raised for good causes on the day. Volunteers – Thank you (In alphabetical order) Adrian Taylor, Alastair Macmillan, Allan Foster, Anthony Jones-Stig, Brian Jones, Carrie Monks, Chantelle Dietz, Chris Djali, Chris Velone, Claire Callaghan, Dan Sumpton, David Darby, Debbie Parkinson, Debbie Rickard, Diane Gore, Edith Burnley, Eleanor Bliss, Enid Kendrick, Erik Newman, Fran Aiken, Gareth Thomas, Gill Foster, Heidi Lipscombe, Helen Sharples, Helen Smith, Hugh Crossan, Ian Trafford, Isla Campbell, Jaime Jones, Janet Monks, Jill Whitham, Jo Jones, Jodie Middleton, John Gore, John Trafford, Judith Hackett, Karen Bliss, Kathy Robertson, Marie Noon, Maddy Ogden, Mark Parry, Mick Hackett, Miles Ogden, Neil Robertson, Nic Macmillan, Nicky Ogden, Paul Dandy, Paul Ogden, Pauline Finch, Penny Murphy, Pete Wilson, Ray Whittingham, Ron Wade, Sam Leake, Sarah Djali, Sheila Carroll, Steven Iddon, Tracey Howson, Viv Newman. Committee – Jaime Jones, Kathy Robertson, Ron Wade, Ian Trafford, Paul Ogden, Christine Crossan, Yvonne Winstanley, Gareth Thomas, Debbie Parkinson, Sarah Djali, Helen Smith, Diane Gore, Marie Noon, Jill Whitham and Clare Callaghan. Raffle Prizes – CostCo at Haydock, Currys PC World Wigan, The Lychgate(Joseph Holt), Studio One Yoga, Boars Head Inn Standish, The Charnley Arms, Halo CHD, La Mama Cafe Restaurant, Robinsons Late Spot, Simply Beautiful Standish, HD Brows and Beauty (Standish Brows & Beauty Bar), Mrs Lyon’s Tea Room, Cinnamon Indian Cuisine in Standish, The Laurels at Charnock, Jo’s Barbers on Preston Road, Bang & Loop Hair and BeautyStandish, Jules Bridal Boutique, Sacred Heart Catholic Church and Gill and Allan Foster. Contractors and support – Heather, Helen and Ian at Wigan Council, everyone at the Better Neighbourhood Fund; PC Clive Rigby and the officers of Greater Manchester Police and PCSOs on the day, Darren and Shaun at ADS Marquees. Phil and Lorraine at Leisuretec; Kev and the team at the Albion Ale House Micropub; Gitte and David at Three Tipsy Mates; Kathryn and the team at Hollyfold Donkey Hire. One Stop Hire, Mark and David at St John Rigby College, Standish Library and Friends of Standish Library; Uniloos, Elle R Leisure, the new owners of The Beeches; Dave Bone and all at Joseph Holt; Adrian Taylor at Taylor Calibration Ltd; Gareth Thomas at RT Design; Sonia Richardson at Tesco and Nicky at MyArtisanMarkets. The Standish Knitters. Local Cooperation – Arnold & Phillips. Emma Appleton/Elsa, Suzanne Causey at Tania Brown limited. Steph, Kathryn and Andrew at Standish High School, Phil Jones, The Globe, The Standish Bellringers, Standish Unity Club, The Standish Centre, Cross Street Arts, Craig at The Hoot, The Wiper Company, everyone at Mrs Lyon’s Tea Room, The Lychgate, Jane Wood Chiropody, Potters Bar, the team at Standish Social Club, St Marie’s Church, and most of all, the residents of Cross Street, Church Street and Market Place. Churches – Rector Andrew Holliday and all at St Wilfrid’s Church, and Janet in the Parish Hall, Reverend Ian P Hamilton and John Grayson at Standish Methodist Church. Our official Christmas Market photographer Phil Jones took many photos of the event. Phil is a professional photographer and you can see his work and buy prints here. Standish Christmas Market was a huge success according to the community, the church, traders, businesses, shops, cafes and pubs across the village, thank-you so much for your kind comments on the Market – held on December 3 – and Standish Christmas Live which followed in the evening and the night before. There was an immense amount of organisation needed and apart from a few issues which we were able to resolve quickly, it passed off fantastically well, we need to thank Councillor Ray Whittingham for allowing us to access £500 of Standish’s Brighter Borough money to pay for the marquees on the Parish Hall car park. Paul Ogden, vice chair of Standish Voice, said: “When Standish Voice was established a couple of years ago, the feedback from across the village was that people wanted the return of large-scale events to increase community spirit. “Standish Voice has been helped by groups throughout the village to organise Standish Christmas Market, including the wonderful Friends of Standish Library, St Wilfrid’s Church, the Women’s Institute, Standish/Wigan Live and Cross Street Arts. “We hope the day brought the community together and encouraged people to come into Standish to boost trade in our shops and businesses and was a celebration of the festive season for us all. “We have many people to thank for making the happen, but special praise must go to our Christmas Market Committee, the entertainers and volunteers on the day, Wigan Council, Councillor Ray Whittingham, the residents and businesses of Cross Street for allowing us to close the road and St Wilfrid’s Church. After the event, Standish Voice’s carried out a feedback consultation exercise asking for comments and holding a digital poll. The results showed a huge proportion of people wanted us to stage another event this December. 210 people voted in the poll and 94% of people thought the market – at which charities raised £7,400 – was ‘excellent’ or ‘good’ and 71% thought it was good value for money. Feedback from many businesses was that their takings for the day were a record figure and 80% of people surveyed said they went to Standish’s shops and businesses as well as the Market. 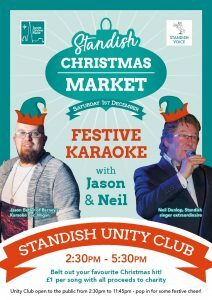 A huge 95% of people who responded want the Market to be put on again this December and 95% also want Standish Voice to organise more community events. Help and assistance: Rector Andrew Holliday and all at St Wilfrid’s Church and the Parish Hall, all the residents of Cross Street, Church Street and Market Place, Wigan Council, Councillor Ray Whittingham, Greater Manchester Police, Gavin and all at The Globe pub, One Stop Hire, Prospect Brewery, Tim Critchley and his Standish Live festival, all the elf knitters, Shirley’s Pies, Hedgehog Sounds, The Country Store, Bargain Booze, Cross Street Arts, Standish Library, Standish Community High School, Gareth Thomas at RT Design, Miles Ogden, ADS Marquees, Leisuretec, The Standish Bellringers, Sonia at Tesco Community Space, The Co-operative, LucyLou’s, Inspired Solutions, Digital Impressions (Wigan), Standish Print and Stationery, Magic Tree, The Secret Garden Cafe and The Wiper Company. Entertainers: Wigan Ukulele Band, Mrs Goulding and the children of St Wilfrid’s C of E Primary Academy’s choir, Standish WI choir, Neville Buchanan, Mrs Parker and the children of Wood Fold Choir, St Maries School Choir, Justified (featuring Neil Lancaster), Tim Critchley and Katie Belle. Raffle prizes: Wigan Athletic FC, Miller & Carter Parbold, Boars Head, The Charnley Arms, Wrightington Country Club, Bargain Booze, Bridal Boutique, Aldi, William Santus & Co and the unnamed members of the Standish Christmas Market Committee. Standish Christmas Market Committee: Paul Ogden, Jaime Jones, Ian Trafford, Kathy Robertson, Heidi Lipscome, Ron Wade, Christine Crossan, Yvonne Winstanley, Debbie Parkinson, Sarah Djali, Helen Smith, Diane Gore, Marie Noon, Jill Whitham and Jacqui Riley. Standish Christmas Market volunteers: Ian Trafford, Jaime Jones, Ron Wade, Paul Ogden, Mark Parry, Neville Buchanan on the piano, Anthony Jones, Heidi Lipscombe, Emma Appleton (the face painting princess), Martin Holden, John Trafford, Sarah Djali, Jill Witham, Helen Smith, Debbie Parkinson, all the Friends of Standish Library elves, Father Christmas, Helen Sharples, Gareth Thomas, Adrian Taylor, Kathy Robertson, Sam Leake, Dan Sumpton, Claire Callaghan, Pete Wilson, Hugh Crossan, Fran Aiken, Janet Monks, Nicky Ogden, Paul Dandy, Diane Gore, Steve Pruden, Michelle Grainger, Katherine Magleave, Phil Bliss, Karen Bliss, Marie Noon, Sandra Ashton, Sophie Ashton, Ray Whittingham, Pat Stancel, John Gore, Sandra Ashton, Sophie Ashton, Allan Foster, Gill Foster, Miles Ogden.